As promised, the blog does not sleep after the excavation is completed! We are extremely pleased to be able to share with you all a film commissioned by the Arts and Humanities Research Council who have been funding our excavations in Lyminge since 2012. Many of you may have already seen this on social media, but we couldn’t leave it out of the blog! The short film examines what we have been doing on Tayne Field since 2012 and if you volunteered with us this summer you might even be able to spot yourself in the background. The AHRC Website have featured this film and the project prominently on their own news site, which we’re incredibly pleased about. It’s fantasic to have the significance of the excavations at Lyminge recognised through funding and dissemination such as this. We’ve also made the video available here on our project website where you can find other videos and media that have been made about the project. We’re also incredibly pleased to have found a new home for the Lyminge Project exhibition that has been travelling around important Kentish Anglo-Saxon sites since November 2012. We updated the exhibition with finds and a new exhibition panel in May 2014 while it was at Maidstone Museum and the whole exhibit has now found a new home for the next six months. If you were unable to get to any of the venues in Kent over the past two years, the Lyminge travelling exhibition is now being housed at the CSI: Sittingbourne exhibition space in the Forum Shopping centre, Sittingbourne, Kent, and a grand opening is being held on 28th October 2014 at 6.15pm. CSI: Sittingbourne is an important community training scheme, training volunteers in artefact conservation techniques, which can only stay open with adequate funding. Please do go along to the Lyminge exhibition and have a look at what CSI: Sittingbourne engages in and support the project if you can. 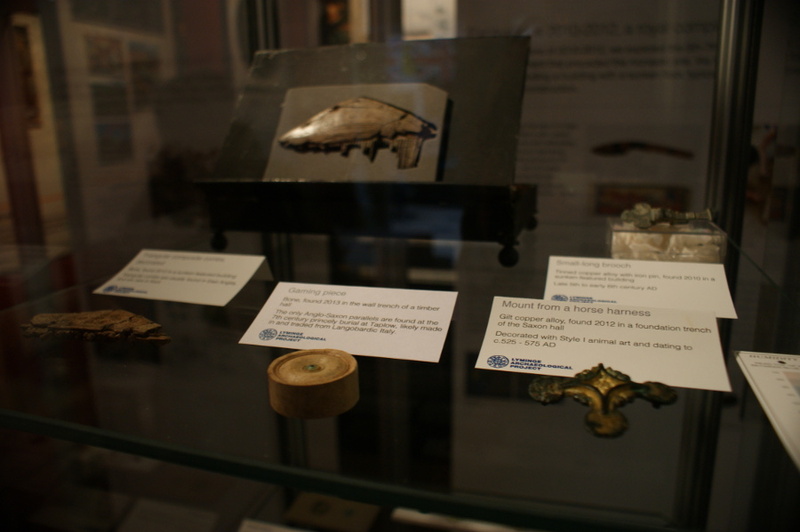 Some of the Lyminge objects on display at CSI: Sittingbourne. Finally, I want to let you all know that the Lyminge Archaeological Project will be featured in the new series of ‘Digging For Britain’, in the episode about the east of England, presented by Professor Alice Roberts and Matt Williams. The date and channel hasn’t yet been confirmed, but it’s likely to be on BBC4 some time in November. I will of course update all social media and the blog when we have a confirmed airing date. We hope you’re all enjoying seeing the project on film this autumn!